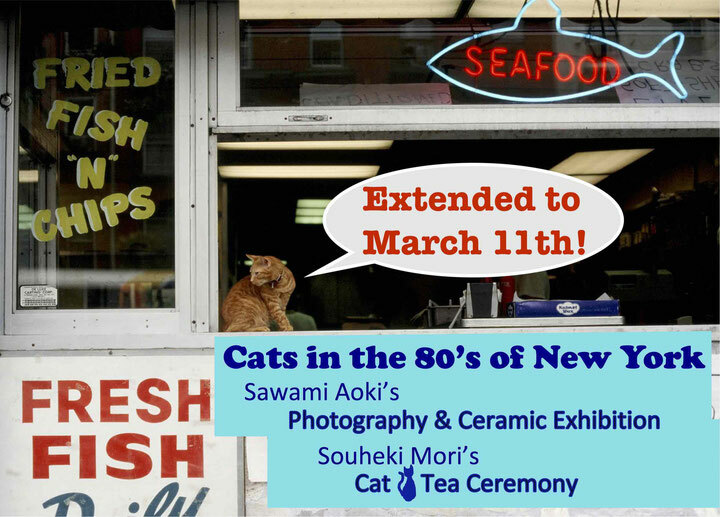 We are pleased to announce that Sawami Aoki will be holding photography and ceramic exhibition on the theme of cats, and Souheki Mori will be holding cat tea ceremony in conjunction with Sawami's exhibition. For the past 30 years, Sawami has photographed cats in New York. This photography exhibition of cats is third time in New York and will focus on East and West Village of the 1980s. 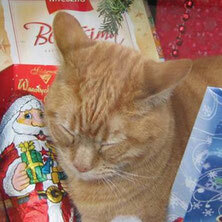 Featuring cats living in bookstores and fish markets, they are loved dearly by New Yorkers. Oil painting, ceramics, sculptures, design and photography, she has earned various shows in these fields. For the cat-designed tea bowls, you can enjoy the taste of Matcha. Being a wife and mother, Sawami Aoki started her career as an artist after she moved to New York in 1985. Using technique of pottery from 1994, her works always reflect who she is, and make everyone smile. 2016 Japan Information Center Gallery, Consulate General of Japan in N.Y.
2015 Japan Information Center Gallery, Consulate General of Japan in N.Y. In April, 2017, Mori opened a matcha tea house named Setsugekka in East Village.Setsugekka offers not only just a cup of matcha beverage but also a meditative moment for busy mind which only a tea master who has over 20 years training can offer. Mori’s grounded, calm presence is almost a balm to visitors who enter a beautiful space. You will enjoy latest cat-designed ceramics by Sawami Aoki and wagashi, Japanese confectionary, in the tea ceremony. * This is an e-ticket.